AUTO: When another «Granblue» rides this unit, you may call this card to Rear-guard Circle. ACT [R]: [Counter Blast (1) & Put this unit into your soul] Look at up to ten cards from the top of your deck, search for up to one «Granblue» from among them, put it into your drop zone, and shuffle your deck. AUTO: When another «Granblue» rides this unit, you may call this card to Rear-guard Circle. ACT [R]: [Counter Blast (1) & Put this unit into your soul] Look at up to ten cards from the top of your deck, search for up to one «Granblue» from among them, put it into your drop zone, and shuffle your deck. ...ahhhh, Nightkid...how do I LOVE this card! Between him, Guiding Zombie and Skeleton Assault Troops Captain, I always preferred this. Guiding Zombie was nice as it's skill is free, however, the fact that it was milling the top 3 cards is a bit of a risk that ended up backfiring more than helping most of the time. Skeleton Assault Troops Captain had the, "Search for a 3 out of 5", skill that most, if not all, clans have these days, but Granblue have other ways to make it to Grade 3 aside from generic rides, so that kind of defeats Skeleton Captain's effect. And then there's Nightkid. Nightkid's skill fits perfecly for Granblue as it makes your Drop Zone more potent for later turns by allowing you to look at TEN cards to put ANY card into the Drop Zone. This makes it so that you don't have to take the risk of losing Triggers and thinning out the deck bit by bit to set up for later combos and slightly increase probability of hitting a Trigger during later Drive Checks. 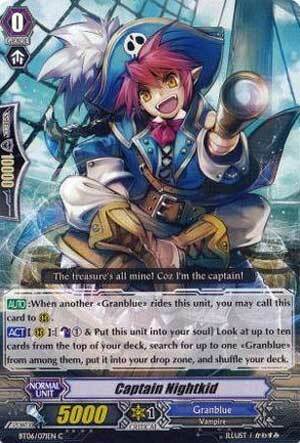 In short, there's a reason on why he's a Captain and my personal choice for the Granblue Starter, and it's because he leads the deck into some of the best combos that Granblue *currently* have! Next Time: What would happen if Nightkid joined the circus instead?